Always wanted the look of cabinet glass but aren't ready to buy all new cabinets? With the rare exception, most cabinet doors can be converted into a gorgeous work of art. We carry all of the patterns to the right, and can custom order even more. We are also the area's experts in curved curio cabinet glass. 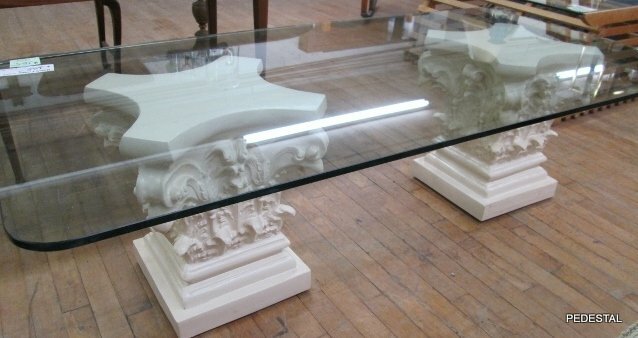 Let us preserve and protect your furniture with a glass top. Thicknesses range from 1/8" to 3/4" , highly polished or beveled. Bring us your measurements, your furniture, or we can even come out to your home to make a perfect pattern. At right, clockwise from top: Heavy glass pedestal top, cuved curio cabinet glass, custom display case, beveled church door glass.